If last year's Samsung Galaxy Camera looked like Dr. Frankenstein had sewn a point-and-shoot camera onto the back of a Galaxy S3, the new Galaxy NX is the opposite. 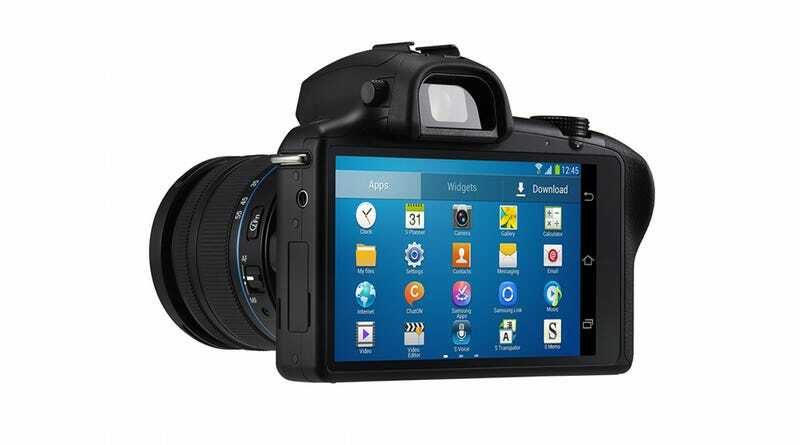 It takes the Android UI 3G/4G/LTE connectivity of a smartphone, and slaps it onto the back of an interchangeable-lens camera. As we learned from last year's Galaxy Camera, Android and connectivity makes cameras better. The user-interfaces on cameras tend to be a disaster and 3G/4G/LTE makes sharing images to social network a breeze. Admittedly, apps and instant-sharing might be less interesting on an interchangeable-lens camera. It's more of a consumer oriented feature set, where as mirrorless NX cameras are designed with semi-pro performance and much higher price tag. The Galaxy NX has the sturdy, larger build of Samsung's NX20 camera as opposed to the more compact design of NX cameras like the NX-300. And as the name implies, it'll be compatible with the full-line of NX-series cameras. The guts are appear to be hand-me-down as well: 20.3-megapixel APS-C sensor. The camera features the company's most advanced image processor (DRIMe IV), it has hybrid contrast and phase detection autofocus that's faster than the older contrast only systems, and can peel off frames at 8.6 frames per second. So far this is a global only announcement, so there is no word on US pricing or availability.